​What is a rain garden? Rain gardens are shallow, planted depressions that absorb water from your roof, allowing it to drain directly into the soil. 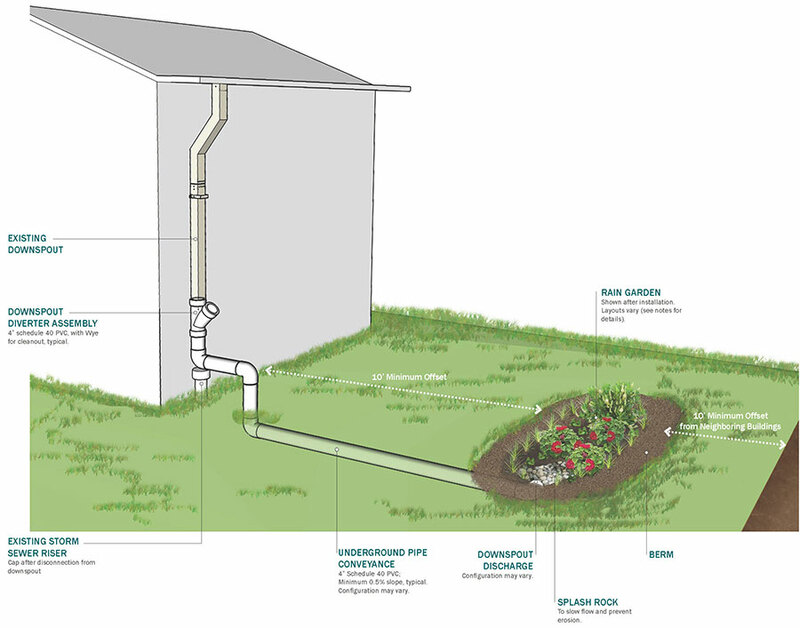 Typically, a downspout from your home is disconnected from the sewer system and diverted into the rain garden, which can prevent hundreds of gallons per year from entering the City’s sewer system. Rain gardens are one of the most cost effective ways to manage stormwater runoff and can be a beautiful addition to your existing landscape design. Participant cost: Rain Check will contribute $16 per square foot towards your rain garden up to a maximum of $2000. At an average price of $17-$25 per square foot, this contribution often covers a very large percentage of the project. Check out this Rain Garden Factsheet in English or Spanish for more information. Preliminary testing: The contractor will perform an infiltration test, which determines how much water your soil can hold. In general, soils in Philadelphia are well-suited for rain gardens. Design: Our expert contractors will work with you to create a design that is appealing and unique to your property. Siting the rain garden: Rain gardens must be planted in an area that is at least 10 feet from a below-ground basements and crawlspaces. Dimensions and Materials: Rain gardens are excavated to a depth of 6” to 12”. 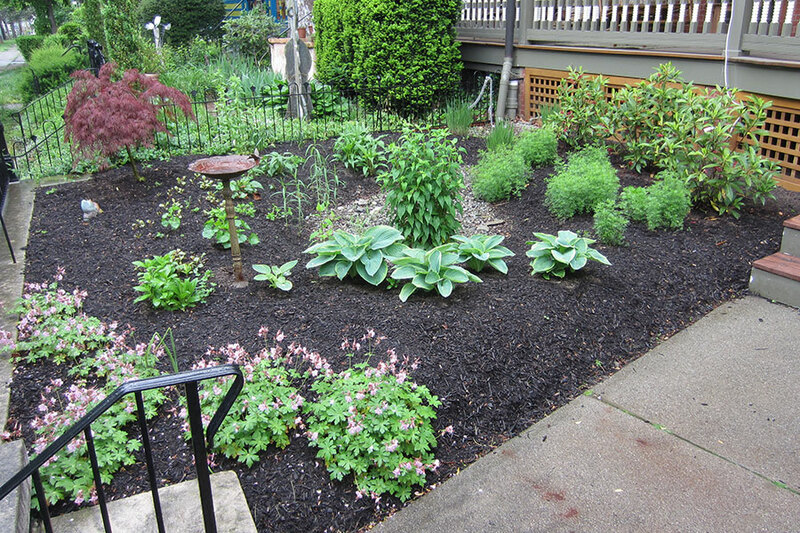 Then, the garden is filled with a stormwater-friendly mix of soil, sand, and compost. Our rain gardens are typically planted with native, drought-tolerant perennial species. These species do the best job of absorbing and filtering stormwater and are very low maintenance. Our rain gardens are planted with young specimens that will thrive over time. The rain gardens are designed to fill in completely over 1-3 growing seasons. In time, they create wonderful habitats for butterflies and birds. Water: Water the rain garden regularly (once per week for the first 2-3 months or so). Deep watering once per week is preferable to daily, shallow watering. Once the plants’ root systems are established, it will only need watering during heat waves or long periods without rain. Weed: Weed and prune as you would any garden. Do not plant edible food in a rain garden: Stormwater running into the garden may carry dirt and debris not suitable for edible plants. In addition, all urban soils should be tested for lead and other potential contaminants before being used for growing edibles. For more information, read the Lead in Soil Factsheet in English or Spanish. After heavy thunderstorms or downpours, check for signs of erosion or gullies. Add more plants, river rocks or mulch to address these concerns. Do not be afraid to move plants around if you think they would do better in drier or wetter parts of the garden. View this list for information about the types of plants that are suitable for a rain garden. Check out the Rain Garden Maintenance Guide in English or Spanish for more tips. Answer these questions to learn what stormwater tool is right for you. Then sign up for a workshop (attendance is required before installation).